Well you’ve come to the right place! You probably are like 98% of all beginners and just don’t know where to begin. Our teachers are standing by to help get you going NOW. We have a complete beginner course created for the absolute, never played before beginner. "My son has joined my guitar academy.He really enjoy learning guitar.He love his teacher Rupam Bhatia because Rupam Bhatia is the best teacher and very friendly withmy son." 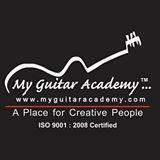 "I joined this Academy(My Guitar Academy).I really enjoy learning Guitar.I searched many Guitar Academies in faridabad and Delhi before joining this and finally choose it.I love my Teacher..Resp/Rupam Bhatia Sir)beacause of his teaching skills and his excellence in Guitar playing.I wish to complete my course with same enthusiasm.I travel every Sunday from faridabad to janakpuri(My Guitar Academy)more than50kms for learning Guitar because of its quality teachings and will also recommend to other students,Who are interested in learning Guitar." "I was searching for a good place to learn guitar but after joining My Guitar Academy (Vikas Puri, New Delhi) my search was stopped. For the last many months, I was searching for a good place to learn guitar but after joining My Guitar Academy (Vikas Puri, New Delhi) my search was stopped. Before joining it, I was under such impression like to learn guitar is a kind of ROCKET SCIENCE, means it was more or less impossible for me to learn guitar but after attending demo class given by Mr. Rupam Bhatia, I was startled & surprised to learn that it was not that much typical task, as I assumed it to be. I would suggest to the guitar lovers and those who are still thinking to learn guitar, they must join My Guitar Academy, as there are simple and easy techniques to learn it. CheersBefore joining it, I was under such impression like to learn guitar is a kind of ROCKET SCIENCE, means it was more or less impossible for me to learn guitar but after attending Demo Class given by Mr. Rupam Bhatia, I was startled & surprised to learn that it was not that much typical task, as I assumed it to be. I would suggest to the guitar lovers and those who are still thinking to learn guitar, they must join My Guitar Academy, as there are simple and easy techniques to learn it." My Guitar Academy conducts classes in Aerobics, Dance and Guitar. It is located in Vikas Puri, Delhi. It takes Regular Classes- at the Institute. It has got 3 reviews till now with 100% positive feedback.